Friday June 7, 9 p.m. - Post supper discussion of the effects of wind, current, and prop walk while maneuvering. 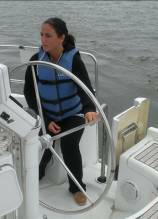 Saturday June 8, 8:00 a.m. to 4:00 p.m. - Boat systems overview, communication, essential knots. Under power exercises. Under sail exercises. Lunch on the water. Dinner ashore. 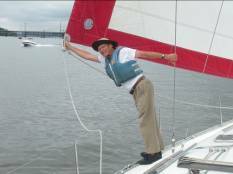 Sunday June 9, 8:30 a.m. to 3:00 p.m. - Under sail - sail trim, man overboard, heave to. Anchoring and rafting drills. Lunch on the water. Please make your check payable to The Sailing Club, Inc. and mail it, along with your completed reservation and release forms, to Gary Brubkaer at the address below. The Club's standard 30-daycancellation policy applies for this event.